At the Candlewood Suites Springfield, we put the amenities where they count in your suite. It's the ultimate extended stay suite for the business traveler. During your stay join the #1 frequent guest stay program in the industry, Priority Club Rewards. 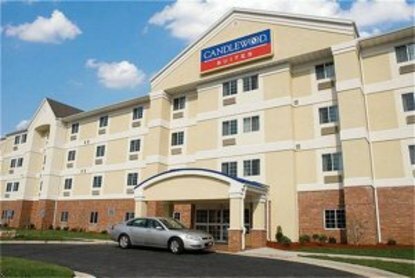 The Candlewood Suites is conveniently located at I44 and Glenstone the perfect meeting spot between Tulsa/Joplin, Kansas City, and St. Louis. Several restaurants are within walking distance from the hotel including, Cracker Barrel and Steak and Shake. Each suite has a fully equipped kitchen with full size refrigerator, stove top, microwave, and dishwasher. Work efficiently at your oversized executive desk with high speed Internet access, two data ports and voicemail. Relax in your overstuffed leather recliner while you enjoy your favorite Cd's and DVDs from our free Lending Library. Work off some stress in our fitness center or visit our Candlewood Cupboard where you can purchase meals, snacks and sundry items at value prices. Pets are welcome for a non-refundable cleaning fee of $75 for 1 to 6 nights or $150 for 7 or more nights. Pet policy must be signed at check-in. Room cleaning is provided once every 7 days. The maximum number of people allowed (including children) in a room is 2 in a room with 1 bed and 4 in a room with 2 beds. The front desk is open 24 hours for your convenience. This hotel is committed to providing accessible facilities under the American Disabilities Act. If your accessibility needs are not met, please contact the Hotel Manager on Duty. Should you require additional information regarding accessible facilities for guests with disabilities, please call 1-800-Holiday (U.S. and Canada) or contact the hotel directly. For the hearing impaired, TDD service is available at 1-800-238-5544 within the U.S. and Canada.